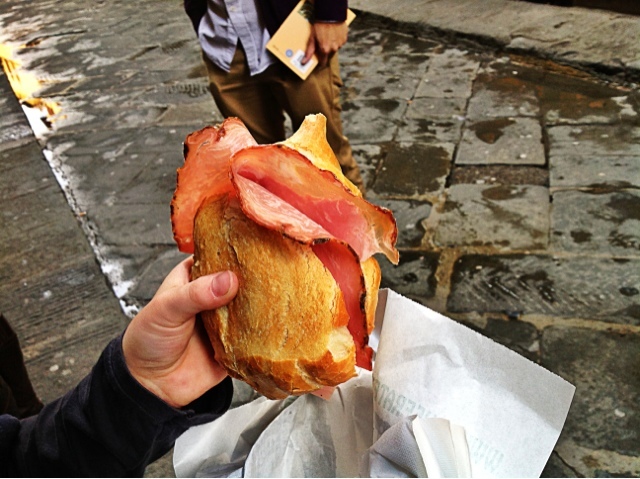 Florence is one of the best cities for food in Italy (the best in my opinion). The pasta is perfect, the pizza is topped with fresh mozzarella, and the panini are made with crisp bread. Like any city, not all restaurants are budget-friendly, but that doesn't mean you have to sacrifice quality for a cheap eat! To find delicious Italian staples and save a few euros, go to these places to get your fix for pizza, panini, gelato, pasta, and chicken. If you’re looking for some of the best Italian food for less…you’re in the right place. It can be hard to find good Italian pizza under five euros, but you can find it at Gusta Pizza, located near Santo Spirito. For 3.50 for marinara (just sauce and crust) or 4 for margherita (sauce, crust, cheese), the prices are hard to beat. Pizzas with more toppings aren't even much more. What's even better is if you split your pizza with a friend, then you'll have some extra cash for a glass of wine! Due Frattelini is always packed at lunch time and for good reason. Part of that is because it is a tiny walk-up kiosk, but mostly because the panini are just that good! And inexpensive, too: 2.50 euro for most sandwiches. The bread is the best part, warm and crisp. The ingredients are fresh - you see them cut up the tomatoes and mozzarella right in front of you. They serve wine as well! You can't beat tasty gelato for only 1.50 euro! My general rule is to only trust gelaterias that serve the small sized gelato for 2 euros or less. More than that, the prices are likely tourist-driven and the quality isn't as great. The gelato at La Carraia is good quality and right across the Ponte alla Carraia bridge. Take your gelato with you to the bridge and enjoy the views while you eat. 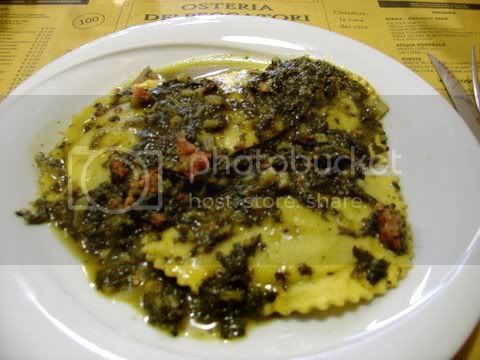 Osteria de' Peccatori is one of my favorite restaurants in Florence. We went there a number of times - it is great for a semi-large group of people or dining solo, whatever works for you. There is a lot of selection on the menu, but the pasta has always been my favorite - especially the gnocchi al pesto or the tortellini labro di prete (7.90 euro each). I'm not quite sure if rotisserie chicken counts as a staple Italian food, but if you need to take a break from all the carbs, head to La Spada for some delicious, juicy take away chicken. For only five euros you get a half chicken and can add a side if you want - potatoes, vegetables, etc. You also have many other choices with the take away selection. (Note that sitting down at the restaurant costs more than it does at the take away shop around the corner, but tastes the same all the less). There you have it - the best places in Florence to get amazing Italian food at a fraction of the price. These are a few examples of my personal favorite places to go from when I used to live in the city – I would often frequent these eateries at least once every other week! I recommend these places and hope you enjoy them too. A: Acqua - whether it's sparkling or flat, water is not free at restaurants, and sometimes more expensive than wine. B: Bars. If you studied abroad between the age of 18-20, you got to enjoy the awesomeness of being of age and getting let in (legally) to a bar. If you were already 21, then you at least got to enjoy going to the bars with all of your friends without leaving out the youngsters. C: Cooking. Italy is the food capital of Europe, and Florence is arguably the best city in Italy for finding the best food and fresh, high quality ingredients. Pesto pizza, pasta bolognese, or a tomato and mozzarella panini...yum. D: Duomo. The most iconic church in Florence is enormous and beautiful. You'll never forget your first time walking up to the piazza and seeing it in person - it literally takes your breath away. E: Experience. One that you'll never forget. F: Florence! Where a majority of American students study abroad in Italy. Also, a small, gorgeous city with beautiful renaissance art. G: Gelato. You know it's good when the smallest size still comes with two flavors. I: Italy. While you spent most of the week in Florence, you likely got to see more of the country - the gorgeous Tuscan countryside, historic Rome, and the beautiful Amalfi Coast were musts. Maybe you made it down to Sicily, or up to Venice. J: Just go. Your motto when deciding whether or not to do that last-minute weekend trip. K: Knocking on the door to a secret bakery at 2am. Warm, nutella-filled croissants for a euro each was the best way to end a night out. L: Language. The beautiful Italian language that flows up and down, and sounds almost musical when listening to locals converse. M: "Molto delizioso" means "very delicious," which is what you answered when your host mom asked how the pesto lasagna she made for lunch was. N: Never leaving. Or what you told yourself while you were in denial during the final days of your study abroad. O: Oltre Arno. Heading across the Arno river to the less touristy part of Florence, where you could encounter some great cafes and shops, and take a breather from the crowds by the Duomo or Santa Croce. R: Resume. Studying abroad is a culturally enriching experience that you should definitely put on your resume. S: Studying. The actual reason you were there. T: Tiramasu. A delicious Italian dessert. U: Umbrella. Something you were so glad you had during the random late summer downpours and also so the guys selling umbrellas on the streets would stop bothering you about buying one. V: Vacation. Knowing that most people only have the opportunity to take a week or two of vacation to Florence, but you were lucky enough to live there for months. W: Wine, and lots of it. Whether it's red or white, you drank way too much of it last night, vow never to drink it again, but then somehow find yourself at Dante's in Florence a few days later with your friends where you proceed to do it all over again. X: X-change rate. Calculating it to see if those 80 euro ($110) shoes were really worth it. Y: Year abroad. Those lucky enough to extend their summer or semester study abroad into a full year. Not all the beautiful places in the world are easily accessible, but in most cases, they're definitely worth the effort. I've had the pleasure of visiting two of my favorite places in Italy, the Amalfi Coast and Lake Como. Lake Como (northern Italy) and the Amalfi Coast (near Naples) are only accessible by taking a bus or car through narrow, winding roads on hills or cliffs. In Amalfi, the pastel houses and hotels are built into the cliffs, and I definitely recommend driving down during the day so you can appreciate the beauty. As you wind into Sorrento, you'll see the houses, the cliffs with the fog/clouds hovering above, and the gorgeous beaches. One of the funniest memories from my study abroad experience (the first time I went to Amalfi) was when our bus got wedged next to another bus going the opposite way. We were literally stuck, with the drivers backing out and backing back in dozens of times to squeeze through. Meanwhile, Italians were honking their horns and shouting behind us (their anger was well-understood). When I went to Lake Como with a friend last year, we took an hour-long bus ride from Como up to Bellagio, the center of the lake. (The lake is shaped like an upside-down Y). We were both still really jet lagged so being on a bus definitely didn't feel the best for our queasy stomachs, however the view driving up was absolutely incredible. I will never forget the adorable houses lining the water from looking out the window on our way up. It was one of the highlights from the trip and I'm glad we went up to Bellagio instead of staying at the bottom of the lake in Como. If you find yourself in Italy during the summertime, I highly recommend these two locations - they are even more breathtaking in person.